Feng Dazhong is Chinese artist born in 1949 in Benxi, Liaoning Province, China. He was interested in art and painting since he was a child, so he Feng started to learn epigraphy and calligraphy. 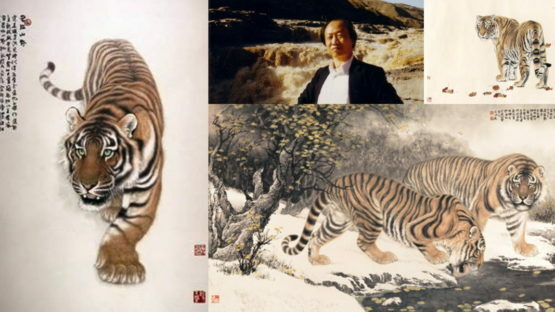 At the age of fifteen, while he was at the junior high-school, he learned to paint tigers from his tutor, veteran painter Li Xiaoru. Other than that he could be said that is a self-taught painter of landscapes and tigers. He is good at drawing landscapes and animals by carrying forward the traditions while creating new things. His style is elegant, unrestrained, which he developed adopting the strategy on one hand towards the tradition, on the other, towards life. He expresses a new artistic conception and explores a new language and a new means to make these traditional subjects modern and enjoyable. About his art Feng said: “I don’t like to paint a pure symbolic subject because that gives us an unreal feeling without an immersed sense, which can’t be interpreted as painting a picture. This is a dialectical relationship. My whole artistic practice is to integrate my understanding of brushstrokes with my feeling of the painted subjects on the basis of cultural conception of traditional Chinese painting.” His works express his personality which is never bounded by rules and stereotypes. His tigers are powerful in appearance and mood, and display full integration of vigor and gentleness, with assimilation of grandeur and details. With his masterful art with whom he impressed a large audience, he gained a name of The No. One Tiger of the World for himself, and is seen as a breakthrough of this genre of painting since the Ming and Qing dynasties. His way of portraying he was developing studying old masters and copying their work. As Feng has said, “I study these masters’ works not to make my works like them, but to transform out of tradition. I learn from life not to simply imitate their works, but to read their works more. Different from the copying of many Chinese painters, my main technique is to explore subjects from life.” His artistic pursuit confirms Chinese painting’s developing progress in the 20th century and its innovative road on the basis of the study of tradition and painting from life. Feng’s works have been exhibited in many different places in China and have won many prizes, both in the international and national exhibitions. He is particularly renowned for his Tiger drawn in Gongbi style, which is acclaimed as the best tiger in China. In 1984, he painted Revival with Song Yugui and won the silver prize in the 6th China Art Exhibition. His work First Snow was awarded the Second prize in the National Show of Works by Young Artists in 1985. His Early Spring won the gold medal at the First China Contemporary Gongbi Paintings Exhibition in 1988. His work Snow Glow (1994) was awarded first-class prize at the Third Contemporary Chinese Gongbi Painting Exhibition. Brilliant Sunshine won the Distinctive prize in the 8th National Art Exhibition in 1994. He also won the grand prize for Literature and Artworks in Liaoning Province for three years in a row. Eighteen of his works have been collected by the China Art Gallery. He exhibited his works on many occasions in his solo exhibitions and many other group shows staged in Japan, Singapore, Taiwan and Hong Kong. His publications include Collection of Paintings by Feng Dazhong and Special Selection of Paintings by Fan Zeng, Song Yugui and Feng Dazhong. Feng’s artwork has achieved significant results on the auctions over the years. His Tigers in the woods was sold at Poly International Auction Co. ’30 Years of Contemporary Chinese Ink Paintings Evening Sales’ in 2011 for $1,265,823. Feng is now a member of Chinese Artists Association, vice-chairman of the Chinese Gongbi Painting Association, vice-chairman of the Liaoning Branch of the Benxi Municipal Cultural Federation and is rated as a national first-class artist.